Garden Benefits | World Living Water Systems Ltd.
Gardens, houseplants, fruit, vegetables and lawns will thrive with the use of the Vortex Water Revitalizer. Soil will also become more capable of holding humidity (water). After about 1-3 months, the amount of water needed for irrigation will gradually reduce by 20%-50%. This is especially important for those in areas susceptible to draught and/or water restrictions. 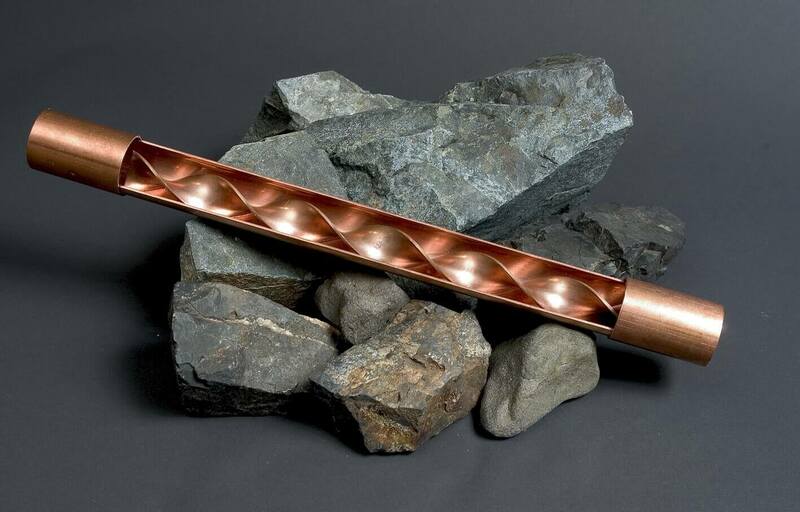 A golf course in France measured a reduction of irrigation water of 30% on one fairway, which was equipped with a 2 inch diameter Vortex Water Revitalizer in Copper. They also reported that this fairway was in a better condition, than any of the others despite the 30% less water. Trees have responded to Revitalized Water by growing faster and stronger. Testimonial: You can find many more testimonials on the Testimonial section of our website. This testimonial is in two parts. First one in 2008 and the second one in 2012. We've been on the property for 4 years. We started planting almost immediately after we arrived. The earth was pretty barren at the time, although redwood stumps surrounded the property and dried weeds were in abundance. When we first started planting, it took a long time for newly planted things to get acclimated and to really start to grow. Since installing the VWR, however, things have taken off within a day or two of putting them in the ground! Rose bushes that were planted just a couple of months ago are producing beautifully large and fragrant flowers. Rhododendrons that were planted this Spring have taken off with unbelievable growth. Bushes that we've had in the ground for 4 years bloomed flowers this year for the first time ever. Our Tower of Jewels grew to over 15 feet this Spring. The leaves on many of our bushes and trees are larger this year than they've ever been. The trees are growing noticeably taller and thicker as if by the day. I am delighted with the results of the VWR [Vortex Water Revitalizer] and a definite believer in its effectiveness. I am extremely grateful that you are making available the VWR [Vortex Water Revitalizer], which has the potential to contribute in such profound ways to the healing of living things on Planet Earth." Here’s what I can tell you about the transformation of this property since moving here in June of 2004. There are about twelve old growth redwoods that were cut down and in various stages of secondary growth. This soil has a reputation of being very acidic and inhospitable to many other things but ferns and a few other green plants that grow in the forest. Although I’m not growing flowers in the vicinity of the Redwoods on the property, I am growing several other ferns, bushes and plants that are thriving. Nothing was growing around that area when I first moved here. There were large portions of the land that were virtually impenetrable red clay. It didn’t matter how much we watered pre-vortex [Vortex Water Revitalizer]. The water was not absorbed and growing was a challenge. Now, all of that dirt is dark brown, has a very healthy population of worms and is growing all manner of trees and bushes. The ground is lush, as is the vegetation. The first couple of summers before we installed the vortex [Vortex Water Revitalizer], we had to water every day for hours just to keep things alive. Now, during the spring and summer, when I turn the drip system back on, with the vortex [Vortex Water Revitalizer], each area gets far less water every other day for between 15 minutes and 1/2 hour at the most. I don’t believe that any area that wasn’t already dripped required additional watering for the last 3 summers at least — that’s how effectively saturated the soil now is. Of course, having healthy trees and bushes helps tremendously, but even in the areas that have weeds, and they are plentiful because the property is way too planted to effectively weed...yet... the ground has been transformed in the manner described. The results are cumulative. Each year, the gardens have become more naturalized even though what is planted is far from being “native” to this area. I’m growing flowering fruit trees, rhododendrons, ornamental maples, hydrangea, roses, wisteria, large maples, an empress tree that each year flowers more and more and has grown into a huge tree in the 5 years that it’s been in the ground, all kinds of bamboo -- even timber bamboo that started out about half the diameter of a dime and is now larger than the diameter of a half dollar, Aurelia, and many other specimens. The garden does not look like it’s 5-7 year old. It looks like the specimens have been here for closer to 15-20 years, so say others. The water is delicious to drink and I’ve stayed healthy with only an occasional cold in an area that is renowned for taking many people down with the flu each winter. I’ve had many things removed altogether, and other things moved to places where they would have better sun or room to grow and/or be better appreciated from an aesthetic perspective. I believe that within the next six months, if you can believe it has taken that long, the structure of the garden will finally be mostly done (as it is never really done), and we’ll be able to focus more on maintenance and refining (weeding and the like). The garden presently is chaotic and messy but extraordinarily lush. The baron ground about which I described is no longer. The earth itself has been transformed into fertile ground, everywhere on the property! The trees that are still here, and there are many that remain, are magnificent! I decided that the most beautiful of the species that I wanted to focus on most were the ornamental maples, which by their nature, grow slowly; the flowering cherry trees, which have grown faster than any that I have seen elsewhere, and the rhododendrons, which as I shared with you when I first wrote to you, have bloomed sooner and more prolifically than what most in this area do. What I can say over the past two years of removing so many things to make room for what remained, and to create space around the species that remained so that you can actually see and appreciate their shapes, is that there have been very few specimens (I can actually count them on one hand) that have not survived the trans-plantings. I attribute this to the revitalizer as well as to the care of my gardener. I have spent hours and hours walking the gardens, dreaming of how to create the space so that it is at one and the same time full and empty, and I believe that in probably two year’s time, the garden will be museum quality, that is, if I can finish the ponds and waterfalls that were dug out but never completed a few years ago. I will be happy to take some photos in the Springtime when things start to come alive again, and you will be able to see all that has occurred on a piece of land that was originally inundated with blackberry and raspberry brambles and where it was a challenge for many things to grow, because the dirt was like dry red clay that simply turned to mud during the winter rains. Below you can see a section of the internal design of the Vortex Water Revitalizer. All models has this design internally. This is how the life forming energetic process of vortex induced implosion is facilitated by the Vortex Water Revitalizer! From Don in Colorado we received this report confirming the instant absorption even into hard dry clay in a drought stricken area! I love it and my garden loves it too! I love showering in the water and of course drinking it. I noticed this year my garden looked rather healthy and even had crops early. The leaves were quite large and I had tomatoes in July. I thought maybe the July part was from global warming; but I knew the large green leaves were from the water. I used zero fertilizer. Next year I will take some pictures for you. I also take the water to work and have given it to people and they all notice the fresh taste and the tingling sensation that comes with it. My front yard is xeriscaped but I do water it and some of the plants were oversized and I can only attribute that to the water. 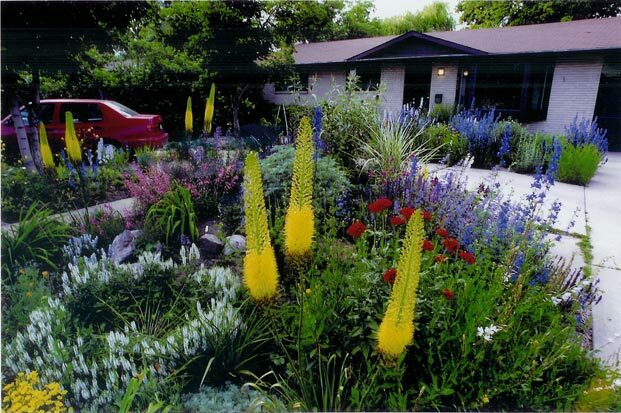 The delphiniums were much taller than normal and many comments were made that it looked like a jungle in the front yard. As I said next year I will attempt to take some pictures for you. The most interesting thing I have noticed about the water is the way the clay soil absorbs it here in Colorado. Before I had the Vortex Water Revitalizer the water would pool or just run over the dry and caked clay. After installing it immediately it was absorbing the water right into the clay. It seems to affect the water tension. My garden in the back was quite amazing the tomatoes, peppers, the Swiss chard were all very lush and green. I cut the Swiss chard and it kept replacing itself throughout the season to a full leaf every time. I never used fertilizer. It almost seemed out of control like a jungle. The taste of the water is also very fresh tasting like its from a stream. I do know this device works as I have seen the results with my own eyes. When you shower with it you also notice the difference it actually makes your hair feel wet and slippery. If I have aches and pains, after showering they go away.